Don’t forget to visit the Puntan Dos Amantes gift shop. 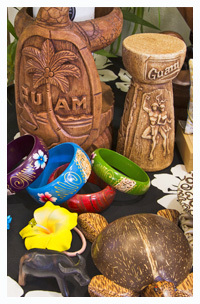 It provides a wide array of locally made crafts and souvenirs. You can pick up a stamped mailer that you can send home right from gift shop. The mailer contains beautiful pictures of Puntan Dos Amantes. Also, you will find post cards depicting some of Guam’s most spectacular views from the “Lookout Point.” If you’re interested in learning more about the legend of Puntan Dos Amantes, you’ll find audio and video souvenirs that tell the legend in three languages. Also, heart locks make the perfect permanent statement of your visit to Guam. Place your heart lock on the “Heart Lock Wall” and come back to Guam and relive the passion and the legend that is Puntan Dos Amantes.